With the kerfing glued and levelled, the final step before attaching the soundboard, is to cut socket for the braces to fit into. These need to be cut as precisely as possible; too short, and the top won’t make a solid bond, too deep, and the brace won’t transmit the energy as well. Using a saw to cut the sides, careful chisel work removes the waste. With the top fitted to the sides, we can glue and clamp. The clamping method I used this time, was to screw short pieces of MDF to the mold, pushing the top down tight. Make sure the mold is held tight to the work surface, however, or it will just lift the mold. 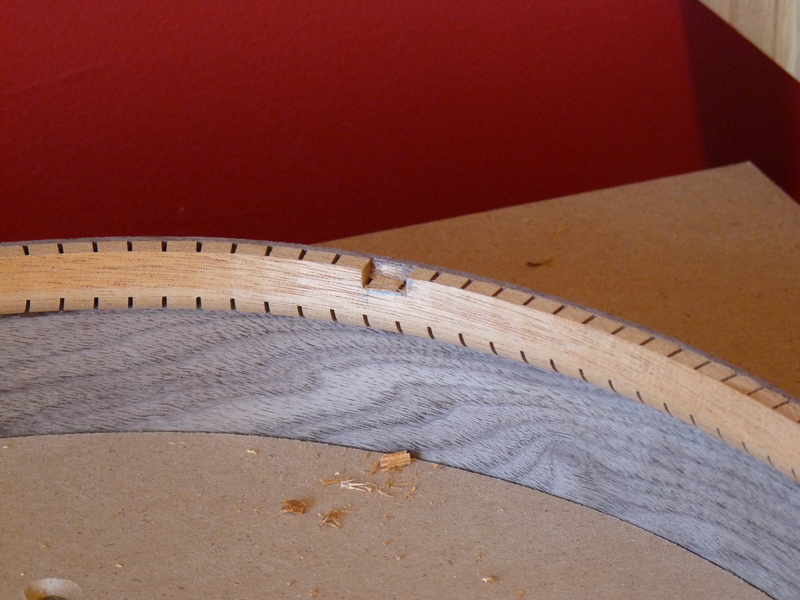 With the top attached, check for any gaps and do any spot glueing and clamping. any holes will create a weakness, in both the structure of the box, and the sound. 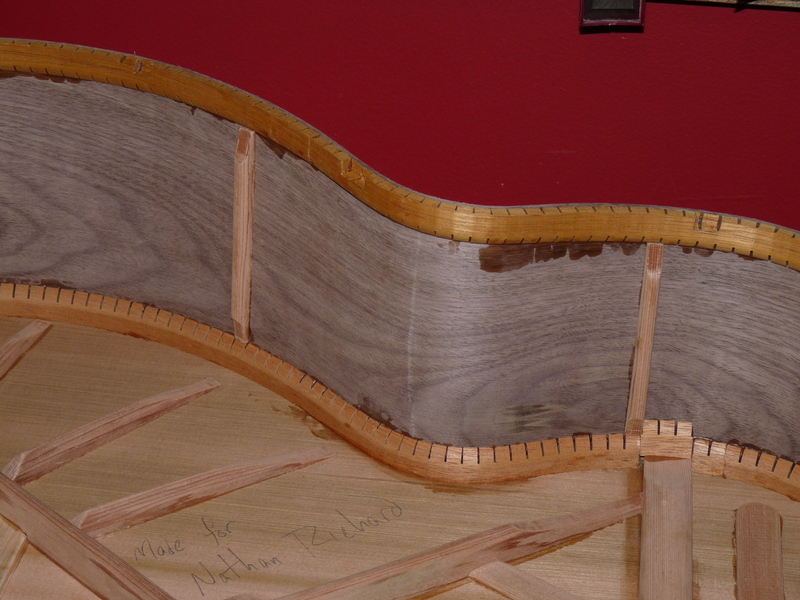 Before repeating the kerfing process for the back, the sides must be angled down towards the headstock, so that the back will have an arch to it from top to bottom, as well as from side to side (from the arched bracing). Once the taper has been marked and sawed, I use a sanding board to even the sides and the cut, as well as to ease the transition from flat to angled. 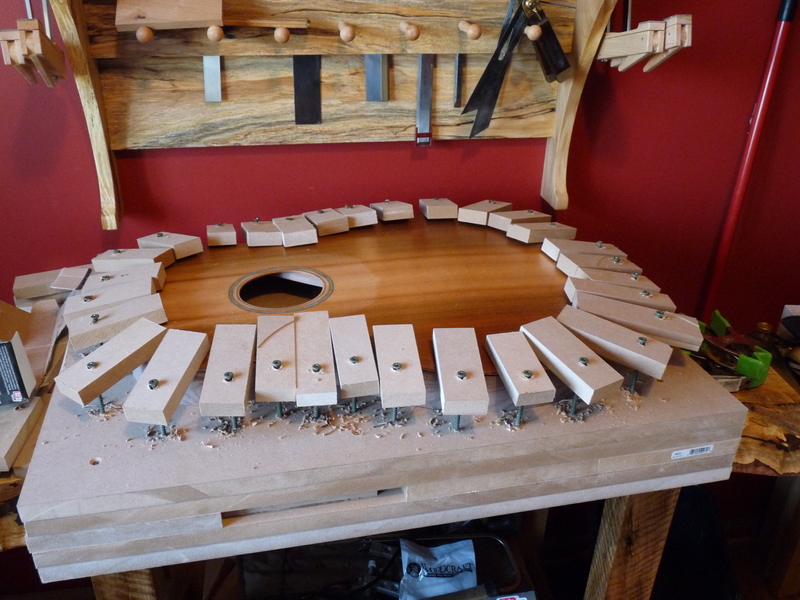 Then, the kerfing is glued and clamped as before, and sockets are cut to fit the back’s braces. 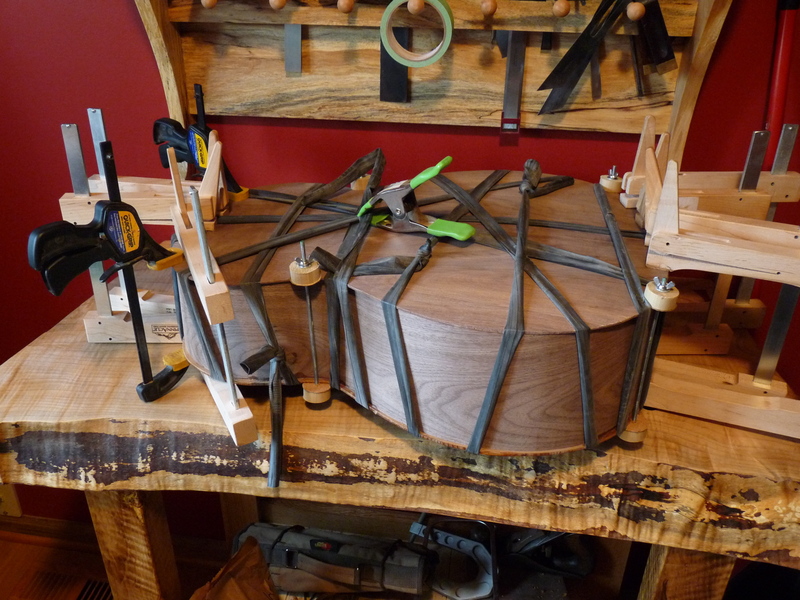 One final step is to add side braces for additional support — especially on an instrument that is this deep. On my parlor guitars, I didn’t need to since the sides weren’t that deep. (In future guitars, I will be using a different side brace technique that puts the braces under the kerfing, extending the whole side.) Also, now is the time to sign the inside of the soundboard, and add any other notes for posterity. After the glued has cured, and everything is tight, the overhang on the top and bottom is trimmed away using a laminate trimmer. 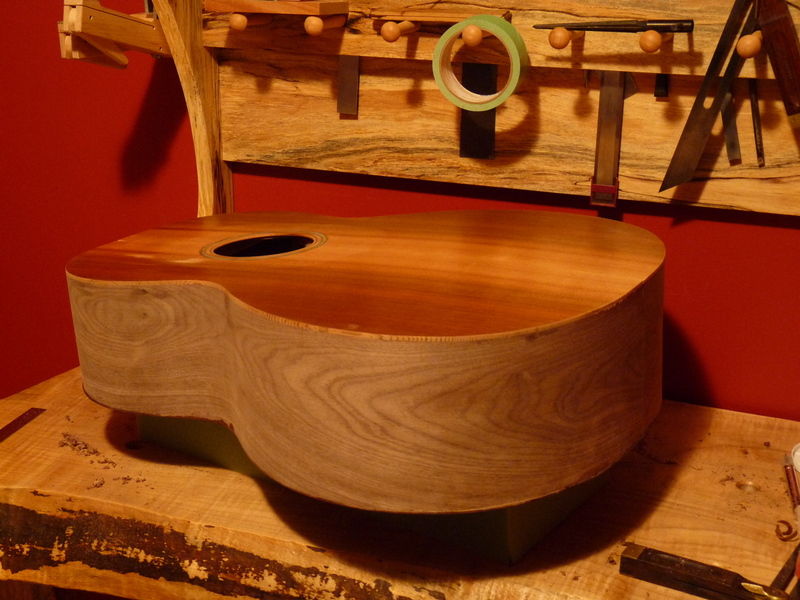 The soundbox is complete, ready for its traditional resonance test of holding a lit match at the soundhole, and thumping the belly. If the match goes out, its a good’n. This one passed! This entry was posted on July 7, 2011 at 6:45 pm and is filed under Acorn House. You can follow any responses to this entry through the RSS 2.0 feed. You can leave a response, or trackback from your own site.